Enchanted Excurse: Kawaii All The Way! Mawnin' Loverlies! This is just a small post today! I wanted to share with y'all a gift I sent a friend of mine, but I had to wait until he received it first. I Did not want to spoil his surprise, lol. I went online and found some cute kawaii cupcakes and sushi to draw from. Sometimes when I am first drawing something, I draw better by looking at an example. I also purchased from Blippo a cute neko plushie charm. Blippo has a lot of cute kawaii items for a very decent price. It did take them almost two months to send it, but I'm assuming that is because I ordered it at the end of December and it is from a different country. I even emailed them about my item, because I was worried about it, and the customer service Representative that emailed me back was very nice and helpful. I enjoy looking at all their items on their store site, I wish I could buy it all! What is your favorite Kawaii store? Have a Blessed Day! The card I made! 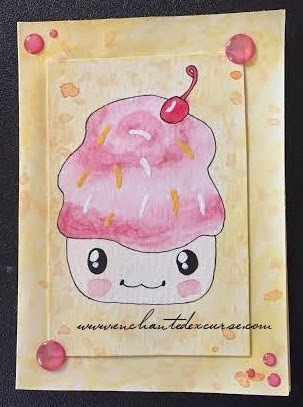 I used watercolor to paint it and for the sprinkles acrylic. 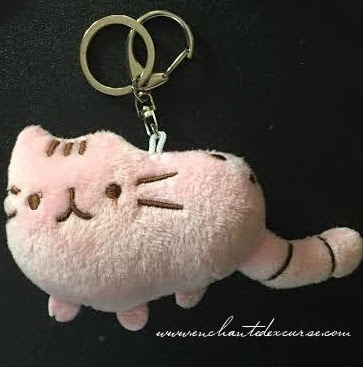 The CUTE plushie neko charm from Blippo! 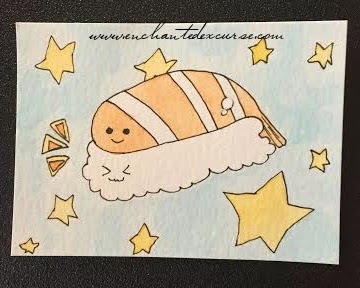 I also made him an ATC, which is an artist trading card.